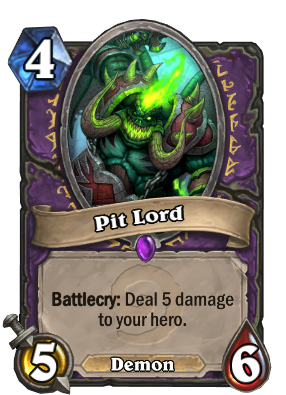 Pit Lord will still be that good card in many warlock decks. Because of it's good body in one minion for 4 mana. How about Skull of the Man'ari or Possessed Lackey? ok but then you just get a 5/6 demon, which is not bad but might take space in a deck which doesn't need an additional body. Doomguard is always played with skull because it has charge, and Voidlord is played because it can be very annoying to remove from board. I don't think there are still good enough reasons to play this card. I feel like he'd be much more playable if he was a 5/7 because that one extra health would make him MUCH more sticky. He'd be able to make favorable trades with nearly all 4 drops and most 5 drops and, without spell damage, only Flame Lance, Forbidden Flame, or Pyroblast would be able to 1 shot him. Has someone tried this in a Demon Renolock? Pitlord, what have they done to you! Yes, but it's a 7 turn combo (when 5/6 stats instead of 4/5 doesn't make really a difference), or you have to pray that the illusionist will survive turn 3. Anyways, +1/+1 for 5 damage isn't worth it in my opinion. It would be soo much more useful with a Battlecry: Discard a random card instead of 5 damage. Not since Kara it isnt. like a succubus gets +1/+1 for the discard, so would this, and since Kara, Combined with Silverware Golem, Malchezar's Imp and Tiny Knight of Evil, Succubus is pretty good. This card + Brann Bronzebeard = Legend. Someone played this when I am playing a rogue. I sapped it back to his hand. He summon it out again and seems very insistence about having him on the board.